Stuart took 20353 down to Rowan Road last night where today it remained hidden in the corner. He noticed a marked sluggishness compared to the B10s/B12s. The wheelchair access is also rather a slow process to implement and will no doubt be unpopular with drivers and the reduced passenger capacity could well be a problem too. Today seemed to pass without incident. All buses seen at Lynn have been adorned with bright yellow stickers in the front window proclaiming 'Revised fares In Operation'. As expected Richard fetched 20353 from Vulcan Road this morning and it remained parked outside Vancouver Avenue garage until the evening. It has a dot matrix style destination which today said 'First Devon & Cornwall'. Although an 05 reg, it looks a bit untidy on the exterior where vinyls have been painted over. The other two are expected to arrive in the coming week. On the X1 today, Bruce was chief scout and he has submitted a comprehensive log of goings on during the day. 65529 came back on L13 07.45 ex Lowestoft, but this came off at Lynn and 20114 took over. 114 had been in trouble earlier when it started the day on K5 07.39 Wisbech - Lowestoft but a problem with its wipers saw 20121 replace it at Lynn. 20120 remains off the road at Lynn. 20505 on the 09.55 from Lowestoft was swapped for 20508 at Lynn and there was also some changes at the Lowestoft end with 20109 on K1 being replaced by 20504 which had gone over on K3, the 10.55 (K3) was 20142 which had earlier been out on the X2. Around lunchtime services westbound were up to 20 minutes late, but all of these returned on time. Things seemed to go downhill again at teatime, possibly because Norwich City were playing at home which always causes congestion. 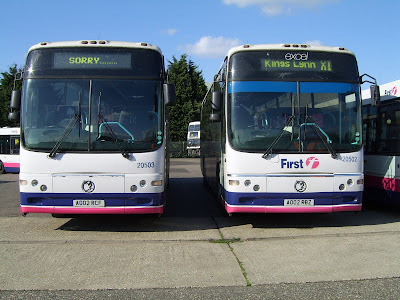 20109 & 20111 ended up at Lynn so both were swapped at some stage as they started out on Lowestoft terminators. Doreen had an unpleasant journey on K15 13.28 ex Peterborough with 20503's air con clearly not working properly. Two Olympians on the X1 ? Well no actually, but one might have thought so. Firstly King's Lynn's J155YRM (30235) did a trip to Peterborough and back to Lynn but it was not in service, merely a test run for clearance purposes for when the new deckers arrive. I passed it at Walpole Highway at 13.50 heading back to Lynn. The people waiting for Y14 12.48 ex Peterborough were a bit confused by it passing by and would have done well to flag it down as there own bus, 20109 was running to FST (Friday Standard Time) and was 28 late. Speaking of Standards and Fridays there were more blog excerpts in the Wisbech Standard newspaper today. The other Olympian concerned was 34951 (see picture above) which seemed to want to escape onto an X1 judging by its destination screen this evening. It was quite an eventful day due to late running and non-available buses. First thing this morning 20120 was sent out on K19 06.37 Lynn - Norwich, it looks like it then took over L13 07.45 ex Lowestoft, a quite regular occurrence until recently - but it didn't get very far and was in Vancouver Avenue this evening minus front panel - crankshaft and oil being amongst its problems. L13 then had 65526 (seen by Bruce) and this returned on 12.18 ex Peterborough as far as Lynn. 20118 which had come in from Lowestoft on K18 then relieved it and headed back east, leaving 65529 to take K18 to Peterborough ! Jamie R was at Peterborough when it arrived and it went to the rail station as booked, however, it then went directly back east without visiting the bus station and passengers had to wait for the next service at 15.28 with 20508. A passenger had been ill on this coach, so at Lynn it was replaced by 20127 which had done the morning part of K20, meanwhile 65529 went through to Gorleston on K18 and consequently spent the night at Yarmouth. 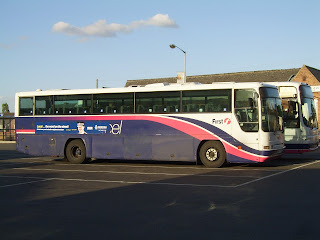 A Lynn man is due to fetch ex First Devon & Cornwall coach 20353 from Norwich tomorrow. Imagine my surprise when Bruce said he'd seen 20111 on K4b 17.48 Peterborough - Lynn last night when I'd alleged that it came in on L12 from Lowestoft - how embarrassing ! Turns out that L12 with 20502 did step up to become L13, but at Lynn not Lowestoft. 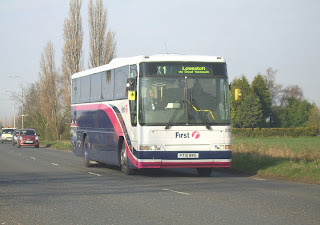 The reason for this is that 20141 failed on L13 16.55 ex Lowestoft at Yarmouth and 20114 on K16 13.48 ex Peterborough was turned round here to become a replacement for 20141 on L13 - got that ? Clear as mud. 20114 was then late into Lynn so 20502 stepped in at 19.59 to do Lynn - Peterborough. Ryan says two of the missing coaches are at Yarmouth Caister Road depot. 20119 is in a bad way and is being assessed while 20117 is blocked in by it awaiting attention. 20105 remained off the road at Lynn today. 20506 needed a tyre change today so it was taken off Y8 09.49 Peterborough - Lowestoft at Lynn and 20127 off K20 (the Norwich turn) replaced it. 20506 was fit in time to do the afternoon portion of K20 which starts with the seat slashing schools turn. 20121 was out today and I had an email from Bruce who was singing its praises after it passed his house on the 12.48 ex Peterborough (Y14) dead on time, however (as predicted by Sam) it expired later and 20508 on K15 had to take the 17. 55 in place of it. 508's turn was then taken by 20120 which had done K16 13.48 ex Peterborough and which is booked to then finish at Lowestoft. 20120 managed to get as far as Nar Ouse Way on its way out of Lynn with the 21.59 to Peterboro' when the driver spotted the oil light flashing, so it turned round and went to Vancouver Avenue where 20503 was fired up to replace it. After two consecutive days with 20127, K19 (the X2 diagram) was given 20114, but by late afternoon this had been replaced by a Lowestoft Olympian. 20118 which had been out on another X2 turn then did the final X1 leg back to Lynn. 20103 was also out on the X2 this morning, but it later also turned up at Lynn on J11 15.55 ex Lowestoft. A photograph on Colin Humphrey's Fotopic site of our missing 20106 was spotted by Sam. Taken yesterday it shows 106 looking very smart minus side advert and more ominously without the Excel lettering on the side. It seems to have been taken at Ipswich and I think we may have seen the last of it. 106 now joins 121 bereft of Excel lettering, now I wonder why 121 doesn't have the word 'Excel' on the side ? Answers on a postcard please to Sam ! I was drafted to our remote Lincolnshire branch today, but fortunately Bruce kept a detailed log of sightings, so we are on top with things. Judith and Bruce both noted 20103 on Y9 06.32 Yarmouth - Peterborough & 10.18 thence to Lowestoft. Tonight it was 3 early at Walpole on the 19.18 ex Peterborough having kept to its booked turn. Ian noted 20508 departing Wisbech eastbound at 17.40 with 'not in service' showing - it should have been the 17.09 to Lowestoft, but had no doubt been caught up by K1 following. It ran empty to Lynn to form the belated 17.42 eastbound service. K4a 07.29 Lynn - Pbo & 08.48 return to Lowestoft ran with 20506, but on arrival this stepped up to become K6 and it is not known what worked the 13.25 ex Lowestoft (K4b). In turn 20501 off K6a became Y8b 14.25 ex Lowestoft. Later 20502 on L12a 11.48 ex Peterborough was delayed to form L13 16.55 return while 20111 was provided to work L12b 16.25 Lowestoft - Lynn. 20105 was off the road at Lynn all day having its nearside suspension examined. It is reported on the East Anglia Buses Yahoo Group that three ex First Devon & Cornwall coaches are due to arrive with FEC shortly. Tuesday 26th August 2008 ~ The return of 114. Norfolk Police Excel Cover Up ! It's 20114. More details are emerging of a power crisis at King's Lynn on Saturday with Kieron reporting that he took 20507 on two trips to Hunstanton after it had undergone a scheduled service. The shortage was caused by six vehicles being unavailable including a Scania and an Olympian both on MOT. Bank Holiday Monday seemed to pass without incident, 20104 & 20121 were the only B10s seen on X1 and all the rest were B12 operated. Today (Tuesday) saw the return to traffic of 20114 (N614APU) which brought in J11 15.55 Lowestoft to Lynn having replaced 20103 which had done the earlier return trip to Peterborough. This was 114's first appearance here since July 6th and it was last seen working on the X2 on 12th July. It retains adverts for Norfolk Police as does 20118. The other B10 which had these, 20116 is now of course working in Scotland. 20500 had its air conditioning system finally sorted out today and it was out tonight on K20 17.17 Norwich - Peterborough. The morning part of K20 was 20503 but this then replaced 20142 on the 10.42 to Lowestoft (K6). There was one other swap today with 20104 on Y8 being replaced by 20131 for the 14.25 ex Lowestoft. In all there were 24 different vehicles out on the 21 turns today including all the B12s. Didn't see everything today, but 20141 was again removed from its diagram tonight when it should have worked the 2059 Lynn to Peterborough. 20508 replaced it. 20501 was out of service today with ripped seats. 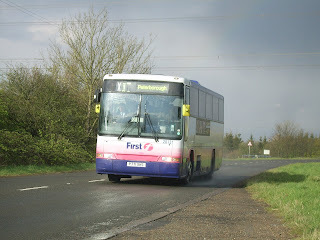 20126 was at Rowan Road despite starting yesterday on K1 which should end up at Lowestoft. Michael saw 20121 on a lunchtime Norwich - Gorleston shuttle after it had worked a couple of days on the X2. My second outing of the week to Peterborough Beerfest, this time on the X1. We did J10, the 10.01 Wisbech - Peterborough with 20124. Karen (Blondie) was driving and an excellent job she made of it too. With a full payload the journey was very comfortable with blowers functioning well and quite clearly 20121 did have a suspension problem last week, as 20124 gave a much better ride. Cheryl was on the following bus (J11) with 20109 which was slightly late, but again a good journey was enjoyed. Cheryl & Ian decided to do the 17.28 from Queensgate (K2) but this failed to appear as did the 17.58 (K4), seen in the morning with 20505. Eventually the hordes boarded 20118 on the 18.28 (K6), with much pushing and shoving and some men behaving as Cheryl says 'like their shoe size'. Things got so bad that the police were there to meet 118 at Wisbech and two characters were carted off, one in handcuffs ! Meanwhile I returned on J11, the 20.28 with 20109 which gave a very pleasant journey without incident. Nice to welcome back two of our regular reporters today. Judith saw 20124 leaving Wisbech at 13.35 heading west, it should have been the 13.01 (K16) but was running in the path of K17. Later she saw 20501 at Walton Highway running 13 late on K7 to Peterborough (due there at 15.19), it was late by a similar margin on its return when I viewed it. Earlier Y14 12.48 ex Peterborough had been 26 late with 20107 and guess who was driving ? Yes the 'late lady' again. The lateness prize however, went to 20503 on K4 due off Wisbech at 17.01, Cheryl saw it leaving at 17.38 and shortly after 20127 arrived a mere 5 down on K1 16.48 from Peterborough. Westbound services gradually improved after this with 20142 only 26 late on K6 17.31 to Peterboro' and seen shortly after it on my way back from a trip to March, 20126 on Y8 only about 4 down. 20126 began the day on K18 but was swapped at Lowestoft and instead of returning on the 10.25, waited until the 14.25. Traffic congestion in Wisbech was particularly bad today with it being a Bank Holiday Friday and a fire at a scrapyard near Weasenham Lane caused further problems around 12.45. Incidentally 'First' have renamed this location 'Weasingham Lane' on their bus stop signs. More beers at Peterborough tomorrow, so yet more X1 experiences in the next blog. Cheers ! For the second day in succession, all ten B12 Paragons were in service on the X1. 20500 which had been on restricted working resumed its normal diagrams yesterday. 20505 had an extension to its day as after arriving at 19.07 from Pbo on the 'early bath' turn (K4) it was callled upon to work the 19.59 back to the Cathedral City after 20104 which had come in on L13 had to be taken out of service, I think for cleaning - let's not go there ! 20508 was seen leaving Wisbech on Y14 12.01 to Peterborough with 'Great Yarmouth via King's Lynn' in the destination panel, just to confuse the locals. ..... or so passengers waiting patiently for J11 12.09 Wisbech - Lowestoft must have thought when 20105 turned up less than 10 minutes before the following departure. This is normally one of the more reliable services and was the black sheep on a day when otherwise things went well. One or two other random services seemed to be delayed including Y14 08.25 ex Lowestoft with 20118, which was almost 15 late leaving Wisbech, but commendably had regained all of this by the time it returned. Later on, the 14.25 Lowestoft - Peterborough due off Wisbech at 18.01 was seen leaving precisely 15 late. 20121 was removed from X1 duty again today, it did K2 08.18 Peterborough - Lowestoft and then was shifted to the X2 while 20124 which itself had been on the X2 took up K2 with the 12.55 to Peterborough. This was the only swap noted however. Later in the evening scheduled roadworks at Guyhirn roundabout caused delays of up to 20 minutes. The reason for the lateness of this entry is because of a visit to the Peterborough Beer Festival. I travelled on a Towlers B10M and while stuck in the queue before Guyhirn we spotted 20503 on K6 18.18 ex Peterborough across the river taking the alternative route via Tholomas Drove and Wisbech St. Mary to reach Wisbech. The roadworks will also be in situ tomorrow night. 20502 - An example to us all ! The Paragons (or Volvo B12s if you prefer) have now been in service on the route for over 6 years and not surprisingly most have run up some phenomenal mileages. 20501 for example has totted up around 79,000 miles so far this year (127000km). An exact forecast of total mileages since new is difficult since originally they were fitted with conventional speedos but following breakages, most if not all, now have wheel hub devices. 20502 has had an exceptional year but had its speedo changed in July. In the year April 07-08 it acheived 131,000 miles. Today it had a rare day off for attention to its tacho and headlights and Lynn still manged to despatch a full compliment of coaches on the X1 without the need to downgrade and use a Scania. The last Paragon to be repainted was 20509 which re-entered service on February 1st 2007. Only 20500/01/07/09 were dealt with and the rest remain in original condition. Some like 20506 are looking very battered now. When new, all the B12s had route destinations above the windows but today only 20501 retains a full set and the rest look positively untidy. What the future holds for them is unclear, but they have certainly paid for themselves on the Peterborough/Lowestoft route. Peter said he wished he'd had his camera this morning as he witnessed 20120 on the first turn off Lynn (K5) overtaking Great Western 0-6-2 tank 5643 in a layby near Thorney. That was about the sum of the excitement today, but there was some pretty dire timekeeping. The 16.01 Wisbech - Peterborough (K1) with 20126 was 12 late, the 16.31 near enough time, but then K4 17.01 with 20503 contrived to be exactly 30 late with 20504 on the following K6 17.31 only 3 minutes behind and consequently 3 late ! Earlier 20141 on the 12.48 Peterborough - Lowestoft (Y14) left Wisbech 19 down with surely the unluckiest of the Lynn lady drivers ? - she always seems to get delayed. On the positive side 20121 managed to complete J10 diagram today without incident, this starts with the 06.40 Gorleston - Peterborough and finishes early at King's Lynn at 18.24. Operations went well today with only odd minor delays. I think all coaches completed their booked turns except 20500 which failed at Dereham at 07.50 on K20 with loss of power. Fitters from Lynn attended and a faulty throttle sensor was diagnosed and repaired. The second half of diagram K20 which is the afternoon empty Lynn - Norwich turn and 17.17 to Peterborough was (by process of elimination, as it was not viewed) a rejuvenated 20121. Michael noted 20104 and 20127 out on the X2s through Beccles today. 20106 is reported as being at Norwich Vulcan Road and Nick Field says 20115 is due to join it in the rail replacement pool very shortly after receiving a new engine. As I mentioned in the previous post, I did the 09.01 Wisbech - Peterborough (Y8) on Saturday morning. Laughter all round when 20121 appeared, nevertheless it got us to there with a full load of passengers and despite a fairly bumpy ride. It managed to survive the day but was failed on arrival at Lynn in the evening with a suspension fault ! Noted en route were 20104 (K6) and 20141 (K1), the latter was probably out on Hunstantons on Friday evening. Thanks to Sam for letting me know that 20500 & 20142 were in use on Norwich - Thetford rail replacements and whilst on the subject, also for finding out that 20112 is no longer a Lynn vehicle as it has been reallocated to Galashiels ! Well bless me, I wonder where 20106 is ? Both 106 and 112 were last out on X1s on July 29th. 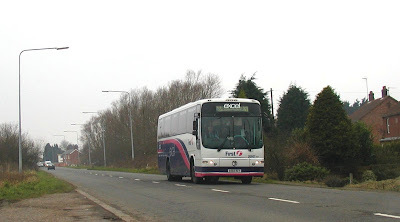 Doreen spotted a broken down X1 coach in a layby on Thorney bypass yesterday lunchtime and Steve reports 65532 as leaving Lynn for Lowestoft around 13.00 - I suspect these two events are connected. 20109 was in Lynn garage tonight with X1 Lowestoft on the blinds, so may be this was the culprit. Pleasant journey back from Peterborough this evening on 20105 on the 19.18 to Lowestoft. Friday August 15th 2008 ~ "I Passed an Old X1 Bus today "
" I passed an old X1 bus today" said my brother-in-law this teatime. He'd seen 65531 arriving at Wisbech at just after 10am on K6 09.18 Peterborough - Lowestoft. Bruce tipped me off about this as he'd seen it at 08.20 passing Walpole Highway. What I didn't realise was that K4 07.29 K-P, 08.48 Pbo -Lft etc was also Scania worked by 65532 ! 65531 was swapped for 20502 which had come off scheduled maintenance and then worked forward to Lowestoft at 10.42, but 65532 I think worked all day on the 'early bath' turn. Hadn't the heart to tell my brother-in-law Neil that the Scanias are in many cases newer than the B10Ms !! This shortage of coaches was caused by 20501/2/8 all being attended to. They were later joined by 20500 back from Volvo, however, this didn't go back into service as it needs an air con pipe which is on order and also needs its destination screen re-programming. 20501 was serviced and then went out on the Hunstantons ! It was unable to show 41a on its destination screen, so instead said 413 (the old service number for this route). 20508 replaced 20504 for J11 09.59 King's Lynn - Peterborough so that the air con fitter could again attend to the latter. It later went out on K20 empty to Norwich to form the 17.17 to Peterborough. Yesterday's mystery of 20141 was not solved today as it was not seen. Late running was prevalent from lunchtime onwards and Bruce took a trip to Lynn where he says " I tried to go to Tesco. Traffic was piled up nose to tail from the A149 Hunstanton Road at Lynn, all round Hardwick roundabout, down Lynn bypass, along A47 and halfway to Terrington St John on the dual carriageway. So Lynn bound X1s must have been severely delayed as must the Peterborough ones that cross the flow several times. Consequently I saw a Lynn bound B10M at the A17/A47 junction at 14.35 with 20505 following and almost within sight of each other!" The first B10 you saw Bruce was Y14 12.48 ex Peterborough which remains unidentified, 20505 was on K15 13.18 Peterborough - Lowestoft. 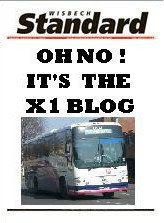 No blog on Saturday as I'm doing the X1 to Peterborough and then supervising a stag party in York ! I'm back on Sunday, but in the meantime any sightings are welcome to the usual address. Thursday 14th August 2008 ~ You've All Done Very Well ! After yesterday evenings frantic goings on, we were due for a quiet day and it seems we got one. Of the 21 diagrams, 20 look to have kept the same bus they started the day with, which must be some kind of record. It was also a Scania free day, unless you know different ! Needless to say punctuality was very good too, with only K6 16.59 Lynn - Peterborough being in excess of 10 minutes in arrears and 20111 had made all this up by the time it set out from Lynn for Lowestoft at 19.42. Only unusual event seems to have been 20141 which should have covered K1 18.12 Lynn - Lowestoft, but which was in Lynn bus station at 19.45. All other incoming services were accounted for, so I guess the 18.12 may have run late and passengers transferred to the 18.42. Alternatively, a Scania could have worked. If the latter was the case it certainly wasn't the favourite 65532, as that was at Lynn this evening. Lynn sent 20121 out on the X2 diagram today (K19), obviously hoping it would get swapped at Lowestoft - it wasn't of course and came back in tonight, still making peculiar noises. Wednesday 13th August 2008 ~ In Sickness and In Health ! 20121 - the Messiah ? - No just a very naughty bus ! Sometimes buses are taken off the road or delayed for trivial reasons - yesterday morning's incident with 20509 for example, where nothing more than a loose windscreen wiper caused a minor delay. Other times it can be mechanical failure (actually quite rare) or that other fact of life - the passengers ! A chain of events this evening was quite entertaining for the observer, but obviously inconvenient and to some degree unpleasant for those involved at the sharp end and they have my sympathy. K6 (16.59 Lynn - Peterborough) ran late this evening and on arrival at Peterborough, 20121 (yes, tell me about it) expired with an electrical fault. 20109 which had just come in to King's Lynn from Lowestoft (J11) was hastily commandeered and returned east at 19.42 on K6 as a replacement. No sooner had this happened than 20141 arrived at Vancouver Avenue complete with passengers on L13 16.55 Lowestoft - Pbo, one of the latter having been ill at the rear of the bus. 20127 off the 19.24 arrival from Lowestoft (L12) was then provided to work forward to Peterborough departing only 13 late. As if this wasn't enough 20111 then came in on the 20.07 arrival from Peterborough (Y8) with more passenger mess to clear up. Not a good evening for the staff involved as you will appreciate, although they coped admirably and should be congratulated for the minimum of fuss and delay with which they executed proceedings. Colin brought back 20121 at 20.30 for more fitters attention. Earlier in the day 65532 worked J10 06.40 from Gorleston but came off at Lynn for 20109 - yes it was Lynn's 20109 fresh off an exam which you heard this morning Bruce, welcoming you back from hols and sounding like a bag of bolts when it passed your house ! There seemed to be delays between Peterborough and Wisbech from mid morning onwards and 20503 on Y14 08.25 ex Lowestoft ( a notoriously poor timekeeper) was 10 late leaving Wisbech but this had escalated to 24 late on its return. K5 15.48 Peterborough - Yarmouth was the worst offender with 20142, it was 34 late from Wisbech in one of today's deluges with 20509 (wipers working hard lol) hard on its heels five minutes behind it on K7. Michael reported 20124 (this was possibly the one seen by Sam which was unidentified) and 20131 both out onthe X2 all day today, but the 'Lynn diagram' (K19) began with 20103, then had Oly 34950 in the middle of the day before 20118 took over for the return to Lynn. Tuesday 12th August 2008 ~ 65532, where are you ? Today began with a couple of incidents, firstly Peter reported 20509 broken down with hazard warning lights on in a layby near Thorney Toll at 07.10. It was on turn K7 and was due to leave Peterborough at 07.13. The problem couldn't have been too severe as this afternoon it was less than 10 late leaving Wisbech westbound, still on K7. 509s reliability is normally excellent incidentally. The same cannot be said of 20121 - see earlier blogs - and today it was taken off the 08.18 Peterborough - Lowestoft (K2) at Lynn with 20501 which had just returned from doing the early morning Norwich turn (K20) going forward. Later 20118 was in trouble again on J11 11.18 ex Peterborough and 20105 was available to relieve it. 65532 once again came to the rescue on K6 07.59 Lynn - Peterborough, however, it seems to have worked the 09.18 Peterborough - Lowestoft and then been replaced by 20111. Whether it returned to Lynn late this evening we will see. Punctuality was pretty good today though there was a deterioration around lunchtime for a while with 20505 being seen arriving at Wisbech at 13.12 westbound, this should have been the 12.31 (K15) but was running as the 13.01 (K16) on which 20103 had begun the day. A better day for punctuality that is, after the recent problems. 20107 on the first turn off Lynn (K5) failed at some point during the day with a steering defect, however, after attention it returned to traffic. Also back after repairs to an oil leak was 20504. 20141 on the 07.59 Lynn - Peterborough (K6) was swapped later at Lowestoft for 20131, good job there wasn't much rain ! 65532 did the first part of the Lynn - Norwich diagram (K20), but was replaced by a coach after this as the afternoon schools part of the turn requires a seatbelt fitted vehicle. For possibly the first time since the X1 began, all the overnight coaches at Lynn were home based examples and all its allocation bar 20109 were present (excluding the absent rail pool 20106/112). This meant all the B12s were reunited of course. Latest rumour is that two will be retained at Lynn when the full fleet of Geminis are in service. Lowestoft sent out 20107, 20120 and 20126 today. This was 20120's first outing to Lynn since July 15th. As things stand Lynn have only 12 serviceable coaches this evening, so a Scania will probably be out on Monday. More questions than answers today ! Services were running behind time through Wisbech around lunchtime. The 13.39 to Lowestoft (Y14) was 19 late leaving with 20142 and the 14.01 to Peterborough (K18) similarly with 20107. The latter had replaced 20121 at Lowestoft on K18 and the inability of 121 to complete turns must be a worry. 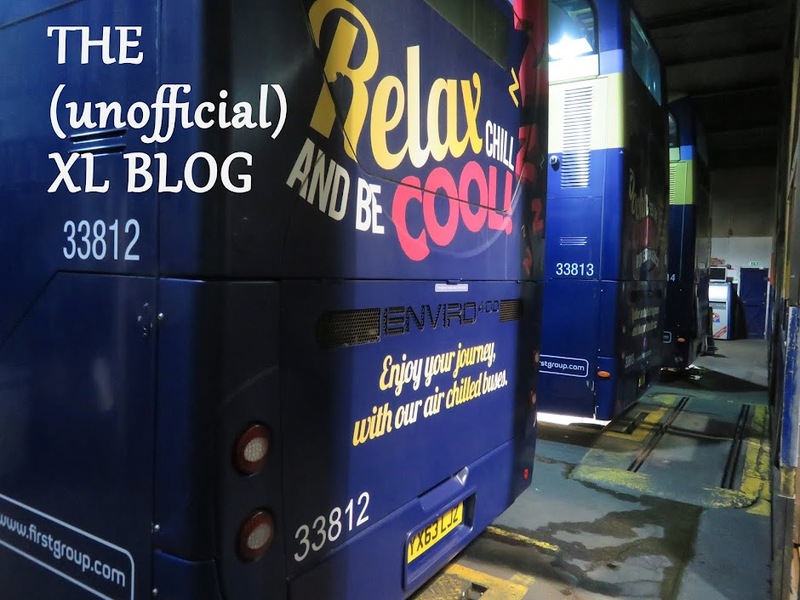 Last Saturday it had extreme difficulty restarting from Lynn bus station on the 20.42 to Lowestoft, seemingly due to a problem with the brakes releasing and Sam has reported problems with 121 before too. Michael spotted 20120 back in action today - it was approaching Norwich from the Yarmouth direction around 13.30, possibly on the 12.38 shuttle from Gorleston. 20111 was the only B10 seen on the X2. Most unusually for a Saturday, 65532 was out on X1 today, though I'm uncertain as to whether it came in on the 18.24 or 19.24 arrival from Lowestoft. It must have taken over from an ailing coach at Lynn at lunchtime. Normally there would be a spare coach to take over, but 20141 was still undergoing an exam and 20500/504 as reported yesterday are blown up. The failed coach was repaired and returned east on the 19.42 to Lowestoft (K6) tonight and 20501 which had been on the diagram was then immediately called upon to relieve 20118 on the 19.59 to Peterborough (L13) after its demisters stopped working. Absent coaches with dates of last workings are as follows : 20114 (X2 12th July), 20117 (x2 17th July), 20119 (X1 2nd Aug) and 20123 (X1 29th July). The two rail fleet coaches 20106 & 20112 have not been seen at Lynn since 29th July. Friday 8th August ~ 888 Unlucky for some. The air con chap came today so 20508 was kept in and 20504 was removed from Y14 08.25 Lowestoft - Pbo at Lynn for attention, it also had an oil problem and has had parts ordered. 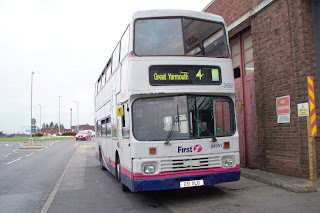 20500 which had also had its air con seen to replaced it, but only did Peterborough and back before being failed with a faulty No.1 injector - this usually entails a trip to Duffields Volvo. Meanwhile 20503 returned to traffic at last. It did K4 07.29 Lynn - Peterborough (the Lynn early finish turn) but Lowestoft laid it over and it ended up on K6 and consequently is overnight there. Late running was commonplace today, worst offender was the 13.18 ex Peterborough (K15)which was 38 late arriving at Wisbech with 20506. Also making a valiant effort to make up lost time was 20124 on the 12.18 from Peterborough which was 28 late at Terrington. By this evening it was about 12 late still on turn L13, the 19.59 westbound from Lynn. The average lateness appeared to be around 15 mins however. There were at least two and possibly three Scania/Wrights out deputising today. Lynn sent 65532 on K6 07.59 to Peterborough and this was later swapped at Lowestoft and came back on Y8 14.25 to Peterborough. It finished this turn which dies at Lynn at 20.07. Another Scania replaced 20118 on L12 11.48 ex Peterborough at Lynn, 20118 then refreshed relieved 20500 on the 14.12 to Lowestoft (Y14), see above. The coach shortage was aggravated by the air con repairs and 20141 undergoing a C exam. Thursday 7th August ~ Clear destinations ? When the B12 Paragons were new, they were all adorned with the Excel logo above the destination panel. This was applied in a rather untidy fashion in some cases, see the picture here of 20507 in which it actually obscures the destination screen ! Over the years new glass has been fitted to the B12s and latterly only 20502 has retained the lettering. The purpose of this little history lesson is because today 20502 has been seen in traffic with a clear destination glass, so ending this little episode. On the road it was 20505 in the news again today. 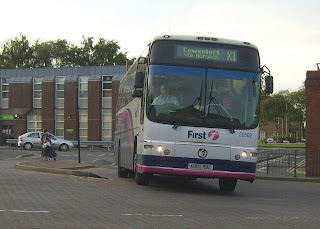 It went east on K6 09.18 Peterborough - Lowestoft and was replaced there by 20105. For the second successive day 20505 then went on to the X2 diagram (K19). Something strange befell 20111 on K5 06.43 Pbo - Lft as it seems to have overtaken at some point 20504 on the preceding 06.54 Wisbech -Lft (K3) with the result that this afternoon 20111 came through first on K3 and 20504 ended up on K5. 20118 was swapped at Lowestoft for 20131 and this came through Wisbech 26 late on the K16 09.25 ex Lowestoft. The new Wright Eclipse Gemini deckers for X1 are now due in Oct/Nov apparently with 37563 - 37579 the allocated fleet numbers. Thanks to Andrew for passing on the info. No doubt due to traffic delays, today was a 'layover' day at Lowestoft. The first turn known to have done this was K16 (the 09.10 arrival) which instead of doing the 09.25 , did the 09.55 (K17) and this pattern continued for most of the day. This meant Lowestoft had to provide extra cover and whilst it is not known what took the 09.25, K4 - the 13.10 arrival with 20141 was changed for 20124 for the 13.25 whilst 20141 took K6, the 13.55. One surprise was 20505 doing K17 (the 09.40 Lowestoft arrival) and then being diverted on to the X2 diagram (K19). 20111 which had started out on this ended up on 16.55 ex Lowestoft (L13). It was a bit of an A47 day today with X1's delayed resulting in several swaps and a Scania outing. First odd thing was K5 and K16 which are both B10 turns being given 20506 and 20501 while B12 turns K17 and K3 were given 20142 and 20141. 20107 did K1 07.48 Pbo -Lft and came back as far as Lynn by which time it had lost so much time that it had missed its 15.29 departure to Peterborough by almost 30 minutes, so it then took up the path of K2 and became the 15.59. Lynn despatched Scania 65525 to Peterborough at 15.29 and this came back as far as Lynn and then 20502 (to be confirmed) went forward. 502 had started out on K2 and I am assuming here that it arrived sometime after 20107 had left at 15.59 and then retired before relieving 65525 and taking K1 to Lowestoft at 18.12. Other changes were less complex. 20118 was put on K4 (the early bath diagram), the idea being that it would be into Lynn at 19.07 and then have a scheduled 'A' service, however, Lowestoft had other ideas and it returned 30 mins later than planned on K6, the 13.55 to Peterborough which is booked to return through to Lowestoft. Lynn took it off at 19.37 and so it got its service after all. The coach off the 18.24 arrival (J10), went back east at 19.42 on K6. I think this was 20127. K6 had started the day with 20508 off a scheduled exam. Star of the day was 20126 - I can hear Bruce cheering - it was 28 late leaving Wisbech westbound on Y14 and on its return from Peterborough had narrowed the deficit to 22 minutes. Tonight it came back as the 17.55 ex Lowestoft as booked, dead on time. The air con man is coming on Friday ! A very good day at last with only exception Scania 65532 on the Lynn - Norwich turn (K20) this morning, but 20509 off an exam replaced it. 65532 is obviously the favourite X1 replacement,much as 65576 used to be. Otherwise very quiet with a solitary hiccup, the failure of 20141 at Walton Highway where it was due to work the 09.49 to Peterborough (J10). After attention it was fit to continue to Wisbech and resume its turn as the 11.39 to Lowestoft. Roadworks west of Wisbech caused delays today and 20508 on the 12.01 to Peterborough (Y14) was already 16 late arriving so must have been well late after that. Work is proceeding on 20503 and it should be back in service this week. Jamie R came over on the 15.48 ex Peterborough (K5)tonight and was very uncomfortable as the air con on 20500 (this turn is usually a B10) as previously reported was not working. Thanks to Paul for getting the numbers while I was away. Returning to last Wednesday briefly and John reports 65532 working the 11.29 Lynn - Peterborough (Y14) after nothing seemingly arrived from the East. It had earlier done K4 08.48 Pbo - Lft as far as Lynn where 20502 went forward. Two of the absent coaches reappeared in my own absence, firstly 20131 which worked into Lynn on Wednesday night and 20121 which returned to work on the X2 on Thursday. On Friday John reported 20119 and 20509 heading west from Lynn within minutes of each other. 20119 was well late on the 14.29 departure (K5) and 20509 had relieved 20505 which was required for maintenance on the 14.59 (K7). Saturday seems to have passed without incident but today (Sunday) there were two evening swaps. Torrential rain swept across West Norfolk this evening and consequently, 20131 was failed for the 19.59 to Peterborough with a badly leaking drivers cab - this has been a source of trouble for about 18 months now on this particular vehicle ! (It is pictured above after a storm earlier this year). 20504 went forward 14 mins late , then an hour later 20111 was failed with an unknown defect and 20501 was summoned to work forward from Vancouver Avenue. I travelled on 20127 on the 09.31 Wisbech - Peterborough on Thursday morning (Y9). It was very warm despite the lack of sunshine and would have been unbearable otherwise. I came back on 20502 on the 17.48 ex Peterborough (K4) on Saturday and the ride was very pleasant indeed with fully working air-con. 20500/04/08 are due to have their air-con looked at this week.